Macross 7 Encore consists of 3 unbroadcasted episodes of the Macross 7 series. &quot;On Stage&quot; focuses on Ray's past as a fighter pilot, how he first met Basara, and how they formed Fire Bomber seen through the eyes of a television expose (think &quot;E-Hollywood True Story&quot;) interspersed with snippets of what really happened. This was very well done, particularly the two bridge girls watching the show. There was also a Veffidas backstory which just left me wanting more. In &quot;Which One Do You Love,&quot; a sick Milia does not expect to live long. 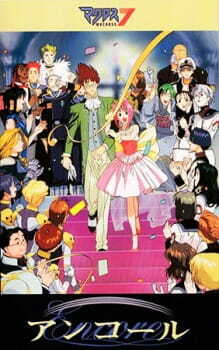 So she attempts to get her affairs in order by arranging Mylene's marriage to Basara, matchmaking Gamlin and going out with a bang. Very enjoyable. In &quot;Fleet of the Strongest Women,&quot; the Macross 7 fleet encounters a rogue Meltrandi fleet led by an old rival of Millia. She and Max head out to try to negotiate peace with the Meltrandi to avert a war. Shades of the original Macross. But Fire Bomber isn't going to stay uninvolved! This episode was very well done. Dated animation and TONS of frame reuse which for some reason didn't bother me much in the OVAs. Not stellar but not horrible, just average. Featured some songs from previous Macross Series - original SDF Macross, and Macross Plus. Used as background music but very effective. Also a new Fire Bomber song. This was a lot better than the 49 episode series especially in character development and backstory. I can't help feeling that a few of these episodes would have improved the flavor of the Macross 7 series.